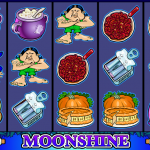 Moonshine is a hilarious video slot game coming from Microgaming. As the name already suggests the slot takes you to the southern countries of America where you will have a chance to see firsthand how the popular Moonshine is made and maybe even get a taste. The name of the drink comes from the people who made it and were called moonshiners. They produced the drink deep in the woods under the cover of night, simply because it’s illegal to make it in the states. The slot has cartoon like symbols and low level animations. Still the bonus features in the slot give it an attractive appeal and make it interesting for online players. The Wild symbol in the game is the Granny and she will substitute for all of the game symbols except the scatter and the bonus symbols. She will also award an 8.000 coins payout if 5 of them land on a winning pay line. The scatter symbol in Moonshine doesn’t trigger any features and will award a top prize of 60 x stake if 5 of them land on the reels. The only bonus feature in the game is the free spins bonus. It is triggered with 3, 4 or 5 Bonus symbols anywhere on the reels. You will start the feature with 3, 4 or 5 free spins on a x1 multiplier depending on the number of triggering symbols. Before the free spins start you are taken to a separate screen where you need to make picks among 18 blocks. Each block can award an extra free spin, extra multiplier or start the free spins bonus. You can win up to 18 free spins played on a x4 multiplier. 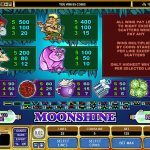 Moonshine is an attractive slot game by Microgaming software, despite its old age. With up to 18 free spins on a x4 multiplier and a rich pay table players can score big payouts in a single spin on the reels of Moonshine. There are some games that are just really fun to play. The next one is one of them: Money Mad Monkey a 5 reel slot by MicroGaming.